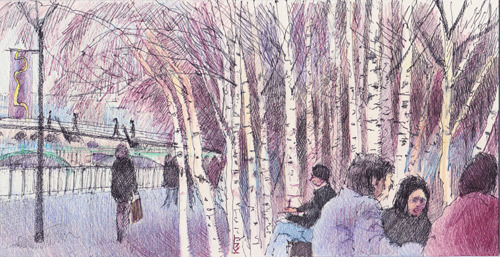 pen and sepia ink and coloured pencils on Mountboard, 9.25" x 4.75"
This was my Postcard from my Walk for April which was sent to Vivien Blackburn and got posted to the Postcard blog last week - see A postcard from London - the meeting place. I've observed that when tackling these monthly postcards, an idea for where I should do a sketch comes into my head straight away. With Vivien it had to be the Mall Galleries because that's where we always meet up when she's in London. Also since I always walk to the Galleries from down by the river and then walk around exhibitions three times, that's got to count as a walk! I've always loved the view down The Mall with the huge plane trees with the really interesting bark and the colours of the dappled sunshine. Then, of course, it's also a good way of remembering that there was a rather big event which involved The Mall last month - on the way from Westminster Abbey to Buckingham Palace! 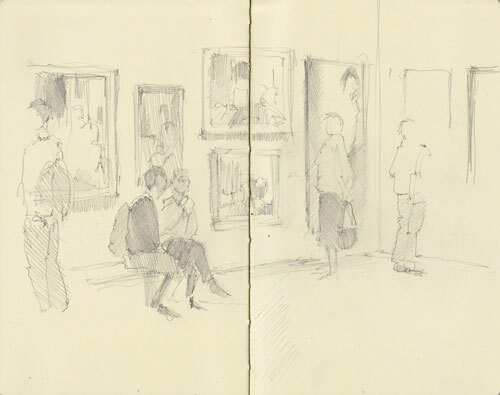 I went back to Tate Britain to get my small sketchbook and ended up doing more three more sketches as I walked around the galleries! The one below in my big sketchbook was generated by watching the BBC programme This Green and Pleasant Land and generated this post yesterday A view of Box Hill, Surrey and English landscape painting on The Art of the Landscape - about the landscape below. 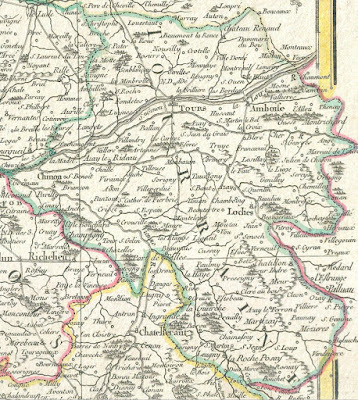 It's thought to be one of the first if not the first paintings by an English painter of a pure landscape - just for the sake of the landscape. After walking round the galleries (fascinating to find Damien Hirst has been consigned to the most inaccessible one!) I went for a cup of tea in the Friends Room. I've never been very fond of the Friends Room at Tate Britain and I worked out why as I sat doing my last sketch of the day. There are absolutely no pictures on the wall. It's a total blank canvas of white washed walls and window. 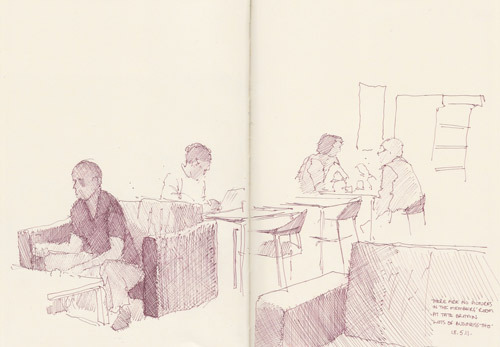 pen and sepia ink in Large Folio Moleskine Sketchbook, 11" x 16"
As always, there were people doing business and keeping up with their online world. 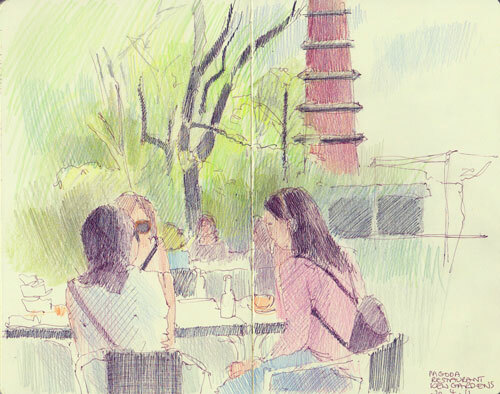 One of the things I've learned about sketching on my own is people seem to forget I can hear their conversations. You learn all about all sorts of things as consultants educate their clients - fascinating stuff! :). 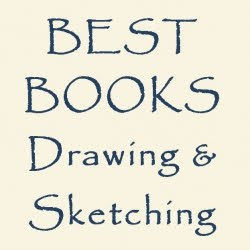 If you've missed all the excitement - see Lost and found - one sketchbook and Turner finished my sketchbook - these are some of the sketches which I very nearly lost as they'd not been scanned. After touring the exhibition about three times, I was sat doing my usual sketches of people visiting the exhibition while having my cup of tea - only to find that I was being entertained by the mellifluous and unmistakable tones of Sir Donald Sinden sat immediately behind me - while I watched Rolf Harris and his wife work their way up the portraits on the wall in front of me! Such is the nature of the Private View for this art society! What was very nice was the bit I'd forgotten until I came to write this post. 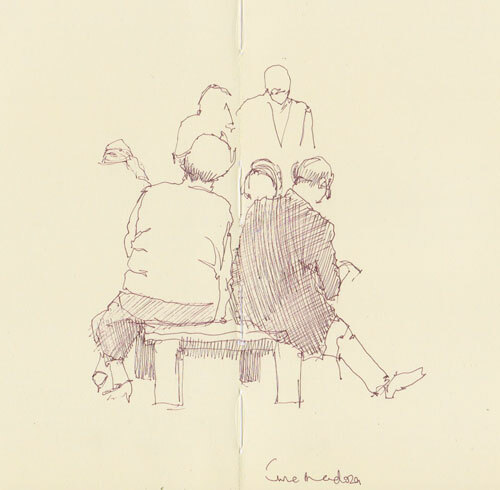 One of the members of the Society was talking to Sir Donald and a member of their party asked to look at my larger sketchbook - and declared that he'd been a professional art dealer and he'd never seen such a nice sketchbook before! I was very chuffed (as we say 'up north'). The exhibition can be seen at the Mall Galleries every day until Friday 20th May between the hours of 10 and 5. Admission £2.50, £1.50 concessions, (Free to FBA Friends, Art Fund members, Westminster Res-card holders and under 16s). Note: June Mendoza is one of the illustrious members of the Royal Society of Portrait Painters. There was article by Valerie Grove - Put Me in the Picture in the Sunday Times Magazine on 1st May - about what it was like to sit for a portrait by June Mendoza AO OBE RP ROI HonSWA. Somehow or other I ran out of steam in 2009 when I was posting my sketches and writing up my last visit to France on this. 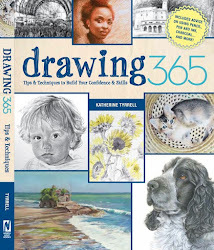 I'm now aiming to get all the remaining posts and sketches published on this blog BEFORE I go to Provence next month. So, of course with that resolution in mind, Blogger decided to take a short holiday and absented itself for about 36 hours! Anyway it's back now and this is the kick-off post. 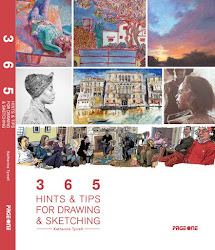 This post Travels with a sketchbook in France (2009) provides the overview of the trip and the links to the blog posts I wrote back in 2009. 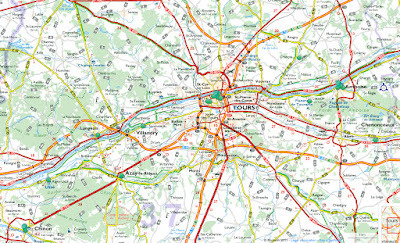 Below is the outline of my trip to the Touraine - although I didn't realise that was what it was called until I got there. 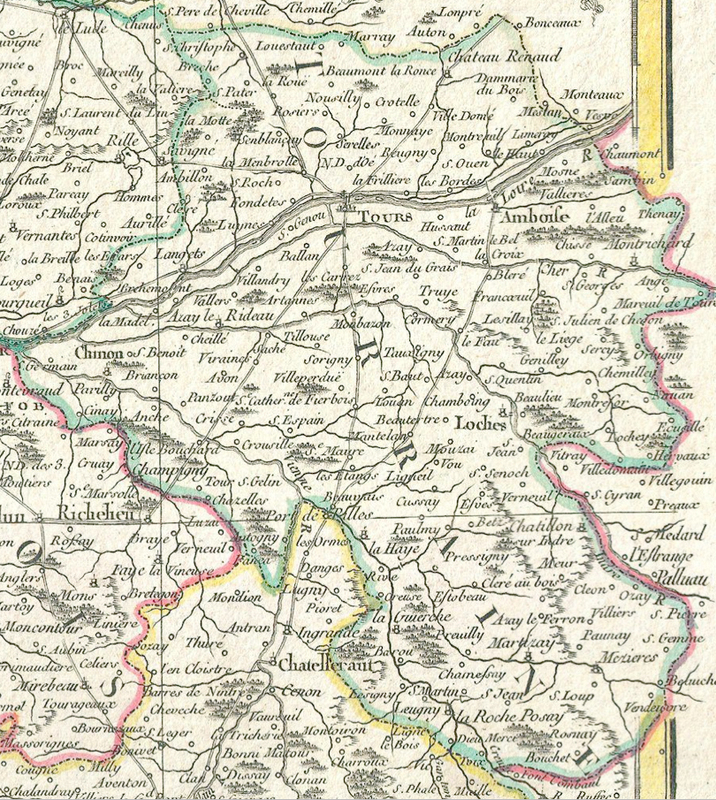 The Touraine is celebrated for its wine and its castles - and we saw a few! Here is the missing itinerary - complete with lots of visits to Châteaux and some pretty spectacular gardens. Friday 9th October - we travelled back to Paris, dropped off the car, my sister and niece headed off to L'aeroport Charles de Gaulle to go back to Australia and I took the Metro to La Mouette to visit the Musée Marmottan. Two sketches of Monet paintings of the water garden and one sketch while having a quick snack before boarding the Eurostar to come back to London - to be met by "he who must not be bored while I sketch"! 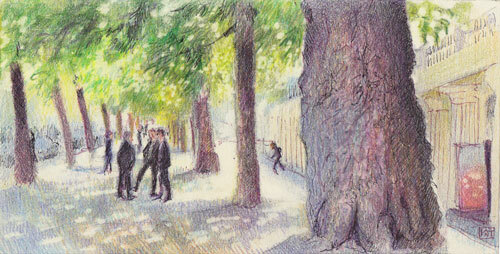 This is a post about my first endeavours to create a proper postcard sketch. By which I mean a sketch on a support which goes into the mail without an envelope and arrives on the other wide of the world without having suffered any undue wear and tear. I've also been looking around for references on the web to the phenomenon of postcard sketching - or mail art as it's sometimes known. You can see what I found at the end of this post. Terrasse à Vernon, an oil painting by Pierre Bonnard, sold the day after I sketched it for a new world record sum for a Bonnard - £6.4 million. Which actually cost the purchaser £7,209,250 ($11,578,056)! That made it the top lot for the Impressionist & Modern Evening Sale on February 9, 2011. That particular day, the 8th February, I'd seen four exhibitions and walked a long way and stood for a lot longer looking at paintings. Standing is absolutely guaranteed to foul up my awful foot with the torn ligments etc and it was perhaps unsurprising that I then had major problems with the foot for the next six weeks - which caused very great difficulties in walking. 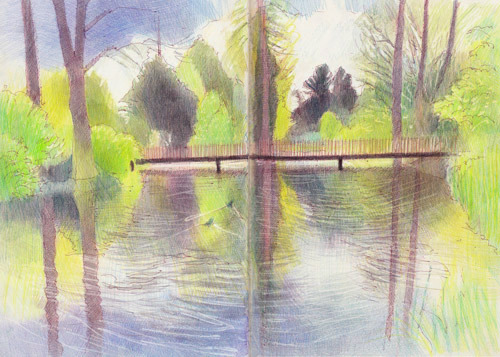 As I was unable to get out and walk very far to do my postcard for the February round of A Postcard from my Walk I decided to try and reproduce the sketch I'd done of the painting in my sketchbook. In the January round of the postcards, some people sent proper postcards (ie without envelopes) and I was keen to have a go. So this time I tried using pen and ink and coloured pencils on Daler Rowney Mountboard - so that I could construct a proper postcard. First I had to work out what was the format for a postcard. The reason for this is that it costs less to send a postcard compared to a letter. So I can work bigger but I'd have to pay more for the postage - especially one which is going overseas! As I'm used to working big and I was quite intrigued as to what would happen if I had to start working small. I used pen and sepia ink and coloured pencils - as per normal. However when I finished I sealed both sides with fixative. My first postcard didn't quite conform to the postcard format as I had to reduce one dimension to keep to the dimensions of the painting. However it went all the way to New South Wales in Australia - to the home of Liz Steel (Liz and Borromini). I've now sent two more postcards off using the maximum format which gives a more panoramic landscape format - which I've decided I rather like. You can see my second one here - Trees at Tate Modern - which went to Martin Stankewitz in Germany and the third has yet to reach its (to be revealed) destination so I can't post it yet. However I have now started cutting up mountboard so I've got lots of postcards to take with me to Provence! The mountboard also works very well with pen and ink and coloured pencil. 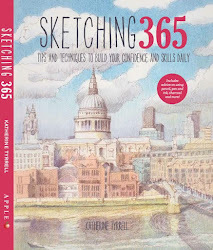 Not as nice as Moleskine sketchbook paper but then nothing is....... It could however make a good support for any other surface I fixed to it (oh how I wish for sheets of Moleskine paper!) I think the next thing to try is a textured surface - maybe using the Daniel Smith watercolour ground or gesso. It's evident that there are a few "Postcard from...." blogs around which tried to emulate Julian's "Postcard from Provence" project - however it looks like quite a few have departed from the postcard format and size. There's also the question of postcard sized and postcard format. For me the latter means it can actually be a postcard and it can actually be sent in the mail as a postcard. 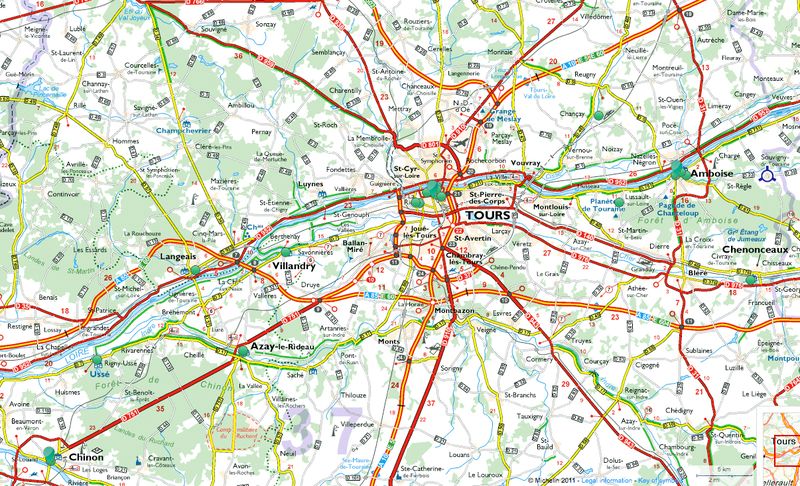 I guess the niceties as to where boundaries on this begin and end is something other people can tell me more about! the RCA Secret is a unique annual exhibition and sale of original postcard-sized art, made by professional artists, designers and illustrators, plus current postgraduate students at the Royal College of Art. This struck me as being more about format size than the actual act of posting the art. You can view the postcards here. So the conclusion I'm coming to at the moment is that maybe there isn't a huge amount of mail art / postcard sketching going on at the moment. There are lots of small works but rather less finds its way into the mailbox. If you know of any links to other projects, blogs, websites or any other resources please let me know. 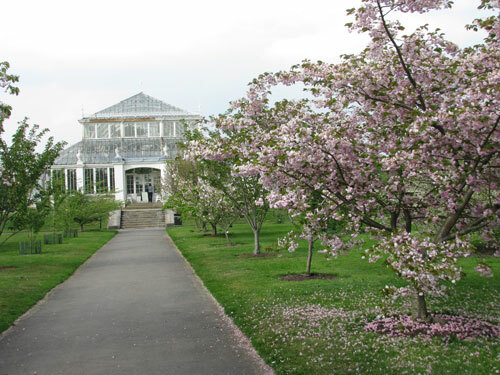 In the last week of April we visited the Royal Botanic Gardens at Kew. We have a routine - set off mid-late morning on the tube, buy sandwiches and fruit at the Tescos outside Kew Station, get to the gardens and sit down and have lunch. Then we start walking round to see what there is to see. It's always different depending on the time of year - but we do like one particular bench in the garden where the Order Beds are for lunch! We started off by surveying surveyed the new veggie patches started by this year's horticultural students. I reckon you can tell who's going to do well during the year by how they've got their bed set up right at the beginning. Some of them have really thought about the design and the construction and how the different elements inter-relate. It's a bit like artists doing their prep work prior to creating a painting. 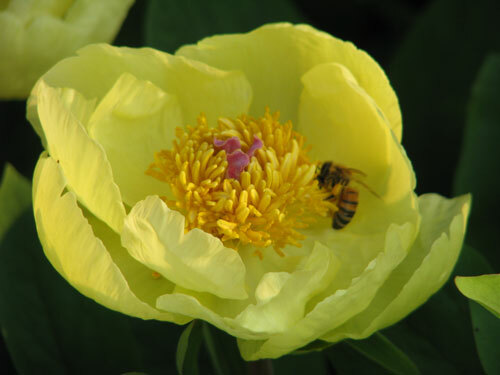 I was very keen to get a good look at the Peonies which seemed about ready to burst - although a few had got going early. The beds in front of the Palm House were an absolute riot of colour with different varieties of tulips mixed in with other bedding plants. Then we set off to go and find the azaleas and rhododendrons which were coming into flower just as the magnolias and lilacs are coming to an end.Everywhere there were daffodils which had 'gone over' and were often horizontal as they died back. After admiring the beginning of the azalea blooms we went and sat on our favourite seat next to the lake - where we were entertained by an absolute cacophony of bird noises and wood munching by the gardeners. 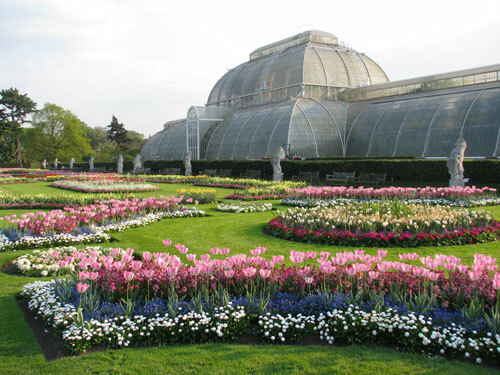 (see The Lake and waterfowl at Kew Gardens). This is where I sat and drew the sketch at the top and wished yet again that I'd sorted out my greens before I went. I had the acids but not the olives so when posting this time I've tweaked it to try and bring out the olive colours which I should have been using! I keep trying to do this sketch every time I come and never ever get it right. I've yet to find a really satisfactory view from the tables outside the Pavilion Restaurant. It's all a bit too enclosed for my liking and the view of the Pagoda is not at as good as it could be. Pity. 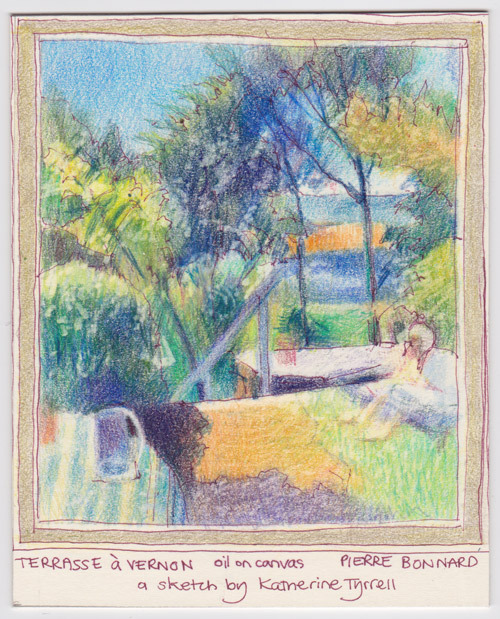 Last year I sketched my mother's garden in early August (see A Cheshire garden in summer and Cosmo weighs up the escape routes). This month I did two sketches. 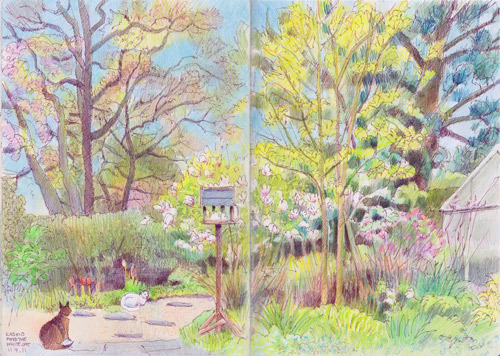 The first is of what the same garden looks like in Spring - sketched in the middle of April this year. From left to right the garden includes cherry blossom, red tulips, a magnolia, an early clematis plus iris starting in the foreground plus lots and lots of fresh green leaves. My cats as usual stake out their territory early on. However Cosmo was rather nonplussed by a white cat who came in the garden and sat down. Should he chase him off or make friends? He just sat there and dithered - he's such a woos! 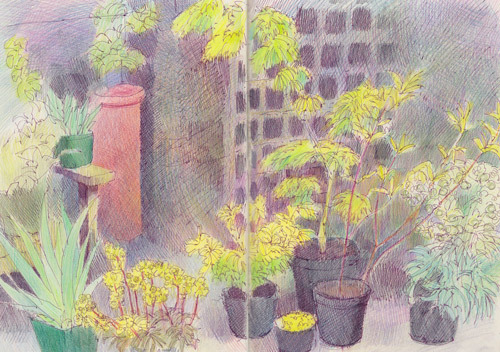 This second sketch is about the plants I bought to go in her front garden which needed a bit of a makeover. They're all lined up below in the shade waiting to be planted. I can never remember names - but I do know that there is now a very nice acer now sitting in a pot in the middle of the garden plus there are three David Austin Roses, some iris, a euphorbia and a cornus. Lots of acid yellow green and red stems and pale yellow/cream/peachy blooms! Plus some blue greens. They do say that every green always goes with every other green!